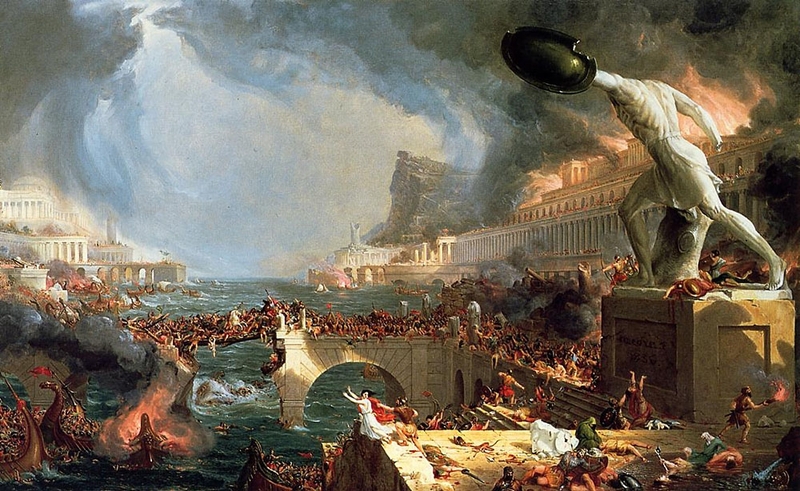 ‘Destruction’, fourth in a five-painting series, “The Course of Empire”, by American artist Thomas Cole (1836). Via Wikimedia Commons. Vigorous think piece by one of the authors of the forthcoming ‘Planning from the Future‘ report. Strong on diagnosis of the weaknesses of the current system, even if correspondingly a little weak on positive suggestions/alternatives. All in all, well worth a read. “The crisis consists precisely in the fact that the old is dying and the new cannot be born; in this interregnum a great variety of morbid symptoms appear.’ – Antonio Gramsci, Prison Notebooks, circa 1930. Long before the November 2016 US elections, there were clear signals that multilateralism was in crisis. In fact, Donald Trump’s election is just the continuation of a downward spiral that has been under way for some time. The most obvious symptom of this trend is the inability of the so-called international community to address armed conflict in any meaningful way. From Afghanistan to Ukraine, from Libya to Yemen, from South Sudan to Syria: the UN Security Council is blocked, and there is no respite in sight for civilians. Many conflicts are now “IHL-free war zones”: international humanitarian law is marginalised and humanitarian principles are jettisoned – whether by state or non-state armed groups. Slaughter, torture, and “surrender or starve” strategies thrive, despite much hand-wringing. Those who do manage to flee war zones do not fare much better. Well before Trump’s election, the cradle of the Western enlightenment, Europe, had become a flag-bearer for an untrammelled rollback of rights. Many state parties to the 1951 refugee convention have abandoned their legal responsibilities, investing instead in deterrence measures aimed at blocking those seeking refuge from the terror of war zones or from tyrannical regimes. Europe is externalising its borders and pursuing short-sighted and aggressive return policies, undermining refugees in places such as Turkey and the Dadaab camp in Kenya, and making aid to the Sahel and Afghanistan conditional on pushbacks or migrant suppression. Meanwhile, the Global South, including some of its poorest countries, continues to host 86 percent of the global refugee population. As the refugee convention looks increasingly tattered, other negotiations on crucial issues have ground to a halt: witness the lack of any concrete intergovernmental consensus since the Paris climate change agreement (which is itself now in peril), including the absence of meaningful outcomes at the three major humanitarian conferences held this past year (the international Red Cross conference in December 2015, the World Humanitarian Summit in May 2016, and the New York summits on refugees and migration in September). Issues are raised, the rhetoric is loud and pompous, but action itself is avoided, or the can just kicked down the road. More agreements are also falling apart. The erosion of the International Criminal Court and significant hostility to the “Responsibility to Protect” agenda, as well as the general decline of international respect for human rights, may well signal the dawn of a “post-human rights era”, meaning that the enforcement and expansion of human rights standards through binding international law is in decline. Meanwhile, populism, nationalism, and jingoism advance all around Europe, in Russia, the Philippines, and elsewhere. Accompanying these trends is a manifest decline in support for globalisation – and for international norms – coupled with a rise in tensions around growing inequality, as power shifts from West to East. Under a Trump presidency, these and other “morbid symptoms” are likely to intensify. This might include the United States distancing itself or even withdrawing from the Paris climate change agreement, cuts to UN budgets and other “unfriendly” international agencies, and the slashing of US humanitarian and development aid, particularly to those countries “that hate us”. It could also lead to further disarray in NATO and in the post-Brexit EU, signalling a retreat from established or traditional interstate diplomatic practice. The rise of populism in Europe and despondency vis-à-vis the European project, the spread of anti-politics, and the growth of the Uber economy, as well as narcissistic cults of the individual only compound these symptoms. Echoes of the 1930s perhaps, with an increasingly irrelevant UN following in the steps of the League of Nations? (Western) humanitarianism has reached its historical limits and is now on the cusp of retreat. The transition from the romantic phase to the technological, institutional, and governance phase is now complete. In other words, the energy that made humanitarianism a means to accomplish valuable ethical ends is waning. The chasm between charisma and bureaucracy is likely to widen, and the propulsive force of the humanitarian “mobilising myth” may sputter. This myth provided a generation of aid workers, individually and collectively, with answers to questions about their place and social functions in the international arena. It has now lost its pathos. It may be replaced by other mobilising myths (non-Western, sovereignty-based, transformational, solidarity-based, or overtly politicised). There are no easy recipes for tackling what has become a system-wide existential crisis. Multilateralism is in retreat and this is likely to continue for the foreseeable future. This will have significant impact on humanitarian action (funding, access, challenges to humanitarian principles, less emphasis on protection). It will also affect the ability of the so-called international community to address the factors that drive crises, such as climate change and a faltering international peace and security apparatus. The void left by the partial retreat of the US into isolationism combined with the global war on terror, now euphemistically re-branded as “countering violent extremism”, and a new coldish war will only deepen this humanitarian malaise. A multi-polar world may not be as sympathetic to humanitarian values and will pose new challenges to humanitarian actors worldwide and particularly to Western-led humanitarianism, which will increasingly find itself outside its domineering comfort zone. The functions that “humanitarian” action performs in the international sphere will change, perhaps dramatically. Historically, humanitarian endeavour – in its discourse, norms and practice – has grown in parallel with the expansion of Western economic and cultural power. Humanitarian action’s multiple functions have included acting as a conveyor belt for Western values, lifestyles, and the promotion of the liberal agenda, while making countries safe for capital. If the West is now in retreat, other centres of humanitarian discourse and practice are bound to blossom and grow. Meanwhile, Western humanitarian action is already being press-ganged into the service of containment (Fortress Europe, for example). This process will likely intensify. If so, this will be a major reversal for humanitarianism as we know it. For decades, humanitarian action represented the smiley face of globalisation. It was one of the West’s ways of opening up to the rest of the world. Now, it is much more about closure, about containment, about shutting the door. It is about keeping the bulk of refugees and “survival migrants” away from the ring-fenced citadels of the North. Caught between the pessimism of reason and the flagging optimism of will, what is the reflective humanitarian to do? Perhaps the first thing is to stand back from the current crisis, the confusing background noise, these “morbid symptoms”, and ask: how did we get here? What are the forces for change and how do we engage with them? Organised humanitarianism is stuck in the eternal present and is poorly equipped to adapt to a more complex, insecure, and threatening world. A more narrowly focused “back to basics” humanitarian enterprise – smaller in size, informed solely by the views and needs of the crisis-affected, and focused on saving and protecting lives in the here and now – would not necessarily be a bad thing. It would perhaps be the best way of nurturing the values and ethos of an enterprise that may be battered, bruised, and often abused but is still often the only available safety net for people in extremis. In any case, it is past time that organised humanitarianism acknowledged that it is in crisis and came to grips with a possible reform agenda. Ideas for change are already on the table. For example, the “Planning From the Future” report, available this week, offers a diagnosis of what ails the system and a broad outline of what change could look like. (Disclosure: I am one of the authors of the report). It also underscores that transformational change in the international system only happens in the aftermath of a major shock. Will the combination of the crisis of multilateralism, climate change, ongoing vicious wars, and massive displacement provide such an impetus? What is certain is that the current humanitarian system, broke, broken or both, won’t serve us well in the new international and political landscape we face. The challenge is to foster one that will.